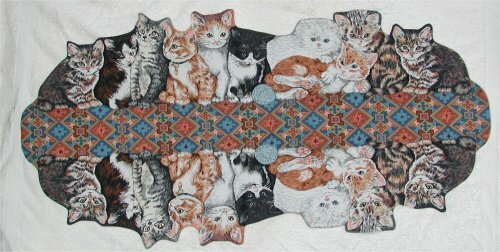 It was at a local quilt show that I discovered a pre-printed panel design of these adorable kittens all snuggled up with each other. It was a pretty weird panel, though ... the line of kittens faced each other on either side of a long narrow stripe. The vendor was able to enlighten me: it was a door draft stopper: you sew it up in a tube, pour some dense stuff inside, close the opening and put at the bottom of a door. However, I didn't see it that way. 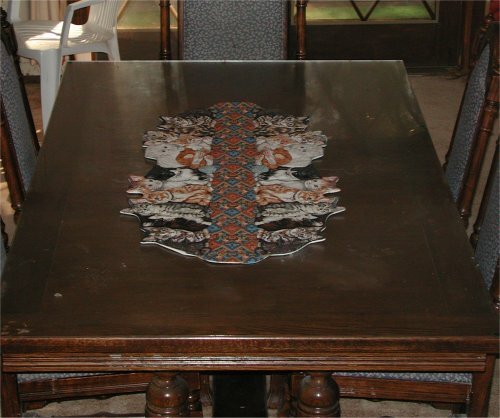 I saw a table runner. The vendor thought I was deranged (he may have been correct! ), but that is what I made. I used cotton batting for thickness and ironing board cover for insulation, so I could put hot dishes on it without the heat going thru to the table underneath. This project went together rather quickly and I'm pleased with the results. I think that kitty-cat placemats should be also on the "To Do" list so the table runner isn't so lonely on the table.